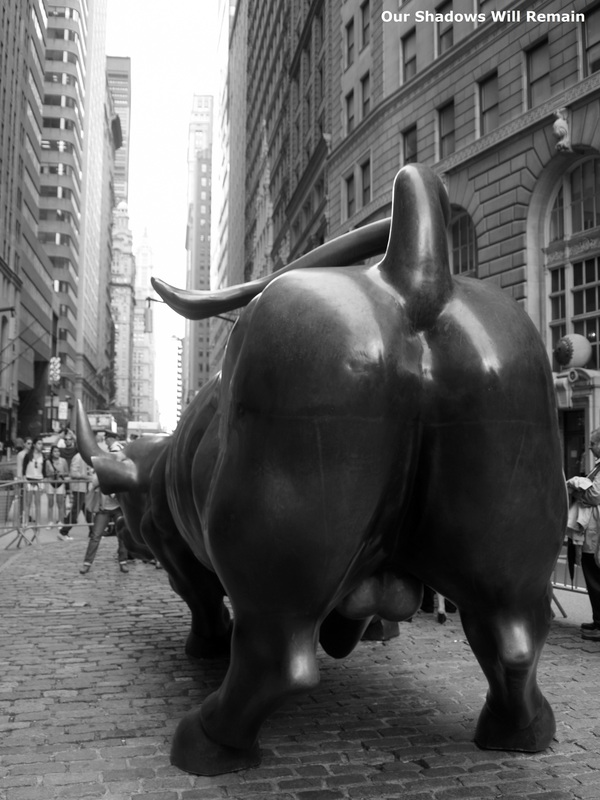 After the 1987 stock market crash artist Di Modica created the Charging Bull sculpture as a symbol of the strength and power of the American people. The sculpture was first placed on Broad Street in front of the New York Stock Exchange. The statue was impounded by the police but after a public outcry the statue was replaced, this time in its permanent place in the plaza at Bowling Green looking up Broadway. The statue has become one of the city’s most photographed artworks and a very popular tourist attraction. During my visit it was crowded with people and the fenced in area guarded by two police officers. It has since become a tradition to touch the Bull’s, for lack of a better word, balls and the bronze in that area has become well polished. The Charging Bull is featured in my post The Lost Landmarks.